I’ve been aware of the work of Finnish director Aki Kaurismaki since 1989’s Leningrad Cowboys Go America. Kaurismaki specializes in movies that move deliberately through sparse environments often populated by marginalized members of the working class. So what would happen if this Finnish director decided to make a film in France? Those who see Kaurismaki’s Le Havre will find out — and you’d do well to be among them. First off, note that Kaurismaki’s movie is named after a city, a port in northwestern France that has known its share of industrial decline. Not surprisingly, Kaurismaki confines his camera to parts of the city that are not likely to enhance its appeal among tourists: a modest home in a back alley, a bar that’s less than commodious and the city’s docks. Moreover, the movie’s main character is a down-on-his-luck shoeshine man (Andre Wilms), who plies his trade at Le Havre’s railroad station. Despite its sometimes dreary settings, Le Havre is anything but depressing. 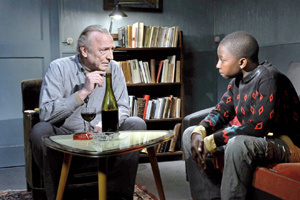 In a quiet and undemonstrative way that challenges all the slam-bang notions of commercial cinema, Kaurismaki celebrates the simple decency that brings Wilms’ Marcel into contact with a boy from Gabon (Blondin Miguel). Miguels’ Idrissa escapes from the police when they open a shipping container that’s being used to smuggle illegal immigrants out of Gabon. Idrissa had been traveling with his grandfather, who was aiming for London, where he hoped to reunite the boy with his mother. For Marcel, helping Idrissa involves little hesitation; he simply does what he deems necessary, hiding Idrissa and making efforts to help him reach London. Idrissa becomes Marcel’s responsibility, even though the shoeshine man’s wife (Kati Outinen) is hospitalized amid dire forecasts about her prospects. Marcel’s endeavors win the support of many of the neighborhood locals, including the woman who runs the bread store and the guy who sells produce, folks who normally fret over how much money Marcel owes them. True to the movie’s unembellished spirit, Idrissa is neither unbearably cute nor strikingly handsome. He’s an ordinary kid who sometimes ignores Marcel’s pleas that he not leave the house. Marcel, of course, knows that there are those who would turn Idrissa in. He also fears that a local detective — a dour-looking Jean-Pierre Darroussin – won’t rest until he finds the kid who eluded the authorities that took Idrissa’s fellow travelers into custody. Le Havre adopts a particularly interesting attitude about illegal immigration. Rather than stoking the fires of lower-class resentment, Kaurismaki shows us characters that favor a relaxed approach to the law, perhaps because they don’t always view it as an ally and perhaps because they simply want to do the right thing. And, oh yes, Kaurismaki finds a way to include the work of aging French rocker Roberto Piazza — also known as Little Bob — in the movie. Little Bob brings a strange but invigorating exuberance to the proceedings. Kaurismaki seems to have decided to reward Marcel’s decency with a near-miraculous end-of-picture twist that would have capsized a more manipulative movie. Le Havre, on the other hand, stays afloat because Kaurismaki seems to think that if a thing is worth stating, it will survive understatement. If Le Havre is a fantasy, so be it. What could be more pleasing (or quietly instructive) in these wretched times than a fantasy in which people behave decently, going the extra mile for someone in need of help? Without resorting to emotional blackmail, Kaurismaki warms the heart. His movie encourages us to respond to kindness.